The USS TARAWA (LHA-1), a Tarawa class amphibious assault ship, was commissioned on 29 MAY 1976. 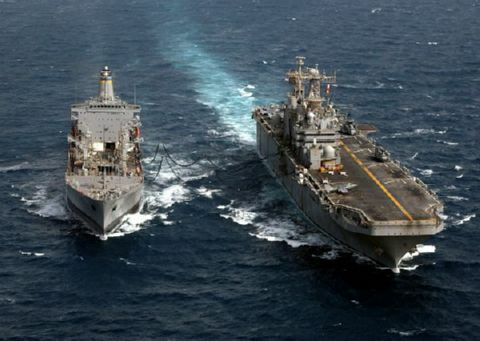 USS TARAWA served her country for 32 years, 10 months and 2 days, until decommissioned on 31 MAR 2009. The second Tarawa (LHA-1) was laid down in November 1972 at Pascagoula Miss. by the Ingalls Shipbuilding Corp. launched on 1 December 1973 sponsored by Mrs. Audrey B. Cushman the wife of General Thomas J. Cushman former Commandant of the Marine Corps. ; and commissioned on 29 May 1976 Capt. James H. Morris in command. Tarawa is the first of five ships in a new class of general-purpose amphibious assault ships and combines in one ship type the functions previously performed by four different types: the amphibious assault ship (LPH) the amphibious transport dock (LPD), the amphibious cargo ship (LKA), and the dock landing ship (LSD). She is capable of landing elements of a Marine Corps battalion landing team and their supporting equipment by landing craft by helicopters or by a combination of both. The ship departed Pascagoula on 7 July 1976 and set a course for the Panama Canal. She transited the canal on 16 July and after a stop at Acapulco Mex. arrived at San Diego on 6 August. During the remainder of 1976 the amphibious assault ship conducted trials tests and shakedown in the southern California operating area. During the first half of 1977 Tarawa was engaged in training exercises off the California coast. On 13 August she entered Long Beach Naval Shipyard for post shakedown availability which was completed on 15 July 1978. Following four and one half months of intensive individual ship and amphibious refresher training with embarked marines Tarawa ended 1978 in her home port of San Diego on Christmas standdown.